Paul Shaw, graphic designer, lettering artist and design historian, delivers a free, public lecture on the works of an early-twentieth-century German schrift künstler. Admittance is free, but reservations are requested. The world of German typefaces in the first half of the 20th century was incomparably rich, though not as widely known as it deserves. Most of the focus has been on the work of Rudolf Koch and the raft of geometric sans serifs that proliferated in the 1920s in the wake of the Bauhaus. Of the many schrift künstlers—Georg Belwe, F.H. Ehmcke, F.W. Kleukens, Walter Tiemann, and E.R. 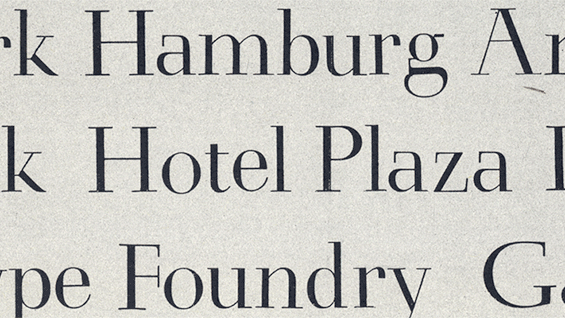 Weiss—whose work dominated German typography and book design at the time, the one most deserving of rediscovery is F.H. Ernst Schneidler (1882–1956). Schneidler studied architecture at the Kunstgewerbeschule Düsseldorf under Peter Behrens and was later a student of Ehmcke’s. From 1920 until 1949 he was the director of the Department of Graphic Arts and Book Design at the Württembergische Staatliche Kunstgewerbeschule in Stuttgart. The program that he created provided an alternative to the crafts expressionism of Koch’s Offenbacher Werkstatt and the modernism of the Bauhaus, emphasizing a broad experimentation that encompassed calligraphy, typography, title page design, monogram and logo design, and book illustration. A sampling of the work that Schneidler and his students did between 1922 and 1935 was gathered into a four-volume portfolio entitled Der Wassermann (1945). His teaching was influential with a number of his students going on to become noted calligraphers and/or type designers in their own right, chief among them Georg Trump, Imre Reiner, Walter Brudi and Albert Kapr. Schneidler’s output as a type designer is not only varied, but fascinating for its reinterpretation of traditional forms. His twenty-one typefaces include a range of blackletters as well as several romans, a script and some designs that are hard to classify. His most famous design is undoubtedly Legende, though Schneidler Initials and Schneidler Mediaeval have had their adherents. This talk will survey all of Schneidler’s type designs, both issued and unissued, in the context of their time. Paul Shaw is the author of The Calligraphic Tradition in Blackletter Type (1999), Helvetica and the New York City Subway (2009), Phil Grushkin: A Designer’s Archive (2013), Revival Type: Digital Typefaces Inspired by the Past (2017); coauthor of Blackletter: Type and National Identity (1998); and editor of The Eternal Letter: Two Millennia of the Classical Roman Capital (2014). He has given talks on the type designs of W.A. Dwiggins, Oswald Cooper, and Frederic W. Goudy as well as on the calligraphy of Bartolomeo Sanvito, Dwiggins, George Salter, and Phil Grushkin. Paul is also well-known for his urban lettering tours.